All photos courtesy San Ysidiro Ranch. Contributing editor Christina Ohly has a knack for finding the world's loveliest hotels. She's found her ultimate in Montecito, California. 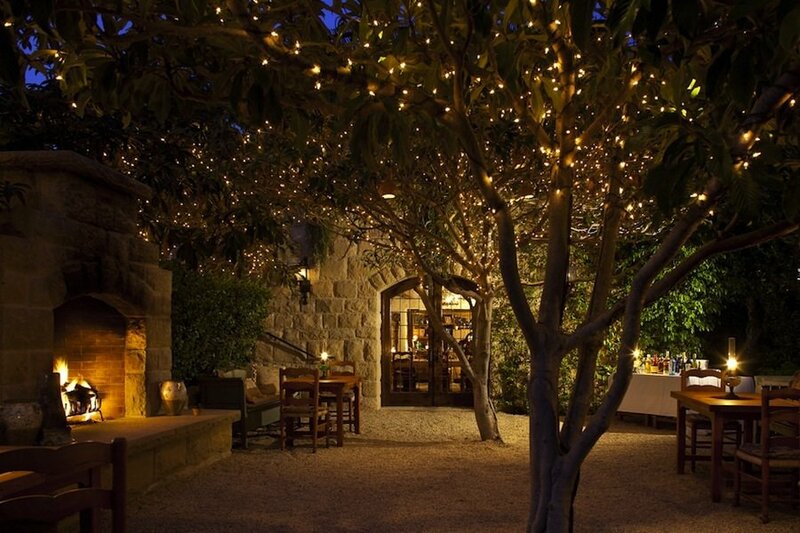 SANTA BARBARA, California – History, old Hollywood, and hospitality in the extreme meet at , a citrus farm-turned-luxury hideaway nestled in the foothills above Montecito. I have wanted to visit this special hotel for years — and even noted it on my Gentedimontagna travel wish list — primarily because I'd heard such wonderful things about the food (almost all of it locally sourced), the laid-back atmosphere combined with scrupulous attention to detail, and the scenic hiking trails that surround the sprawling, 500-acre spread. I was not disappointed on any front, and San Ysidro Ranch has shot to the number one position on my list of favorite hotels of all time. We're talking an overall outstanding user experience — a 12 on a scale of 1-10. There are not adequate words to describe the perfection you'll find here, but it's an understatement to say that San Ysidro is worth a detour, a long weekend, a honeymoon, a mellow family vacation, or all of the above. We're talking Nirvana here. 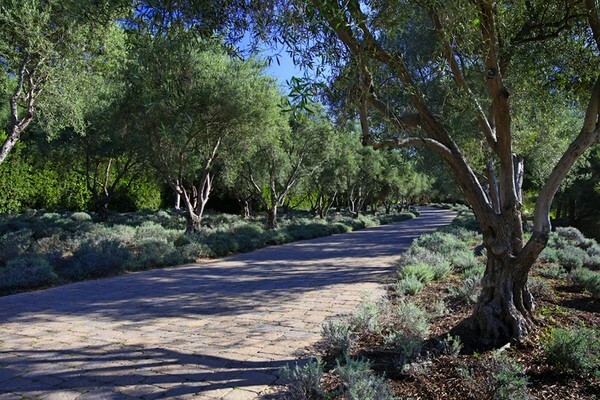 Bliss at San Ysidro begins in the driveway. It all begins upon check-in, which isn't really a registration at all, as you are greeted in the driveway and whisked straight to your lovely yet low-key cottage. No pesky paperwork here. They cater to a clientele that likes privacy: Silicon Valley techpreneurs, Hollywood starlets. 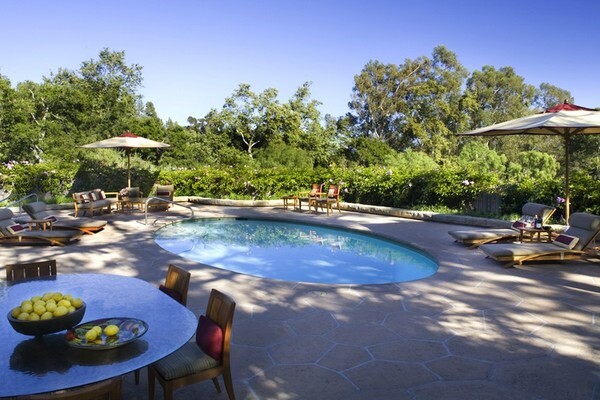 If you're really looking to splash out, the Ty Warner Cottage, with private patio and pool, is as swank as it gets. Our home for three days — and you really do feel as if the house is yours — came complete with sumptuous robes, stacks of reading material, and freshly made snacks at every turn. The difference here is in the little touches: endless chips and salsa, local wines on ice, crisp copies of the Financial Times at the crack of dawn. Nothing has been overlooked, and sitting on my bougainvillea-laden porch watching the sunset with a cold Diet Coke in hand was simply perfection. Bungalow-style cottages are individually designed, with big sitting rooms, tons of amenities, and peaceful terraces. The Magnolia room has cozy spaces and a wood-burning fireplace. Bathrooms have high ceilings and claw-foot bathtubs. 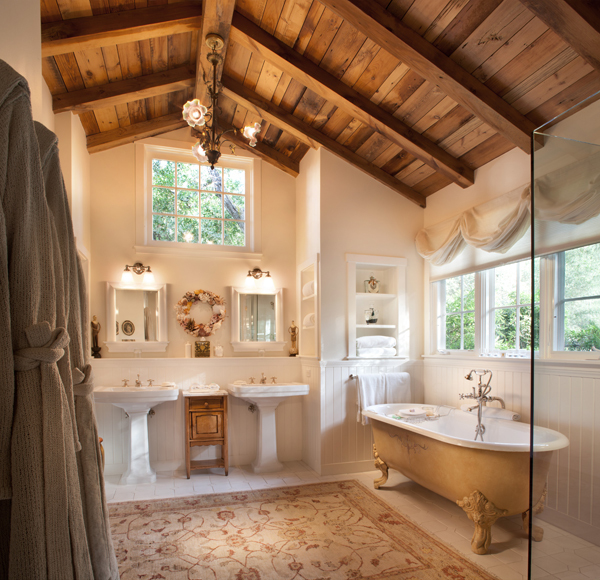 Each cottage is decorated differently, and whether you're in the most basic one-bedroom or in the spacious Ty Warner Cottage (so named after the current owner and Beanie Baby entrepreneur), the bathrooms have soaring ceilings and tubs that are made for soaking. The décor is not the least bit slick or mod, but rather country chic, which only adds to the overall charm and ambience. The main hacienda — the reception area — was once the focal part of the ranch and now provides a spacious place for people to commune with others (never happens), play board games, and enjoy a constant supply of warm cookies. You're likely to run into Seamus McManus, an Irishman and a consummate hotelier who is happy to share stories about the Ranch and its celebrity-studded past: Audrey Hepburn, Bing Crosby, Winston Churchill, and President and Jackie Kennedy all spent time here, and Hollywood's A-list now comes with kids in tow. 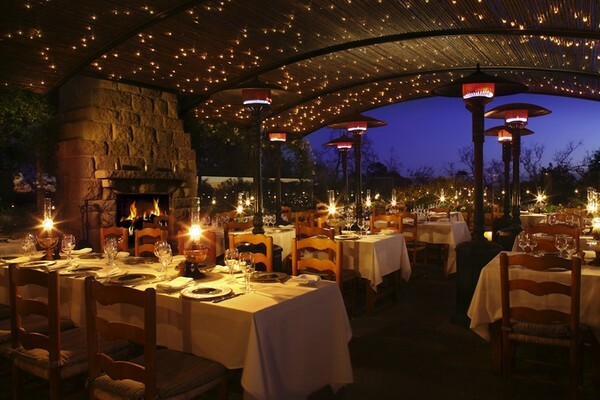 The Stonehouse patio serves delicious food, much of it from the Ranch's organic garden. The Plow & Angel serves SoCal versions of classic pub fare. The highlights (and there are so many) are the hotel's two restaurants — the slightly more formal Stonehouse and the relaxed Plow & Angel, where farm-to-table eating takes on a whole new meaning. 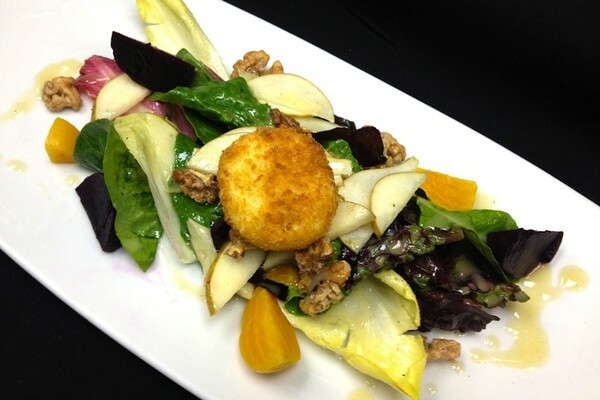 Much of the produce is grown on the Ranch's organic garden and the cuisine is simply top-notch — and brilliantly simple. I had some of the best wood-fired pizzas and sashimi I've ever tasted beneath an arbor of twinkling orange trees. This being wine country, the lists are extensive, and the sommeliers are approachable and happy to educate anyone (my curious kids included) about local vintages and $5,000 bottles alike. Breakfast is not served in either restaurant, as guests typically prefer to take it in their rooms in front of the fireplace or on their front porch with sweeping views and fragrant magnolia and orange blossoms. The chic simple pool area. There are more than seventeen miles of manicured yet challenging hiking trails that run through the property, as well as a minimalist-chic hilltop pool that I could easily spend a month lolling beside. 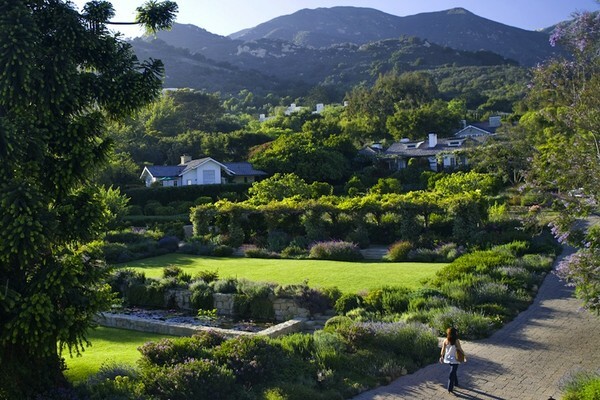 Nestled in the foothills of Montecito, San Ysidro Ranch has about five hundred acres of spectacular gardens, hiking trails, and elegant cottages. With 360° degree views of the Santa Ynez Mountains and the Pacific Ocean, San Ysidro Ranch will make you forget civilization in the best possible way. You'll only interact with other guests as you'd like. I can still see the California light, taste the scrumptious food, and feel the gentle warmth of that Santa Barbara sun. I'm hoping my Zen lasts until I can return to this utterly tasteful, tranquil spot. Fly: is 15 miles away. Otherwise, Los Angeles is about 100 miles south. San Ysidro Ranch is located just off Highway 101.